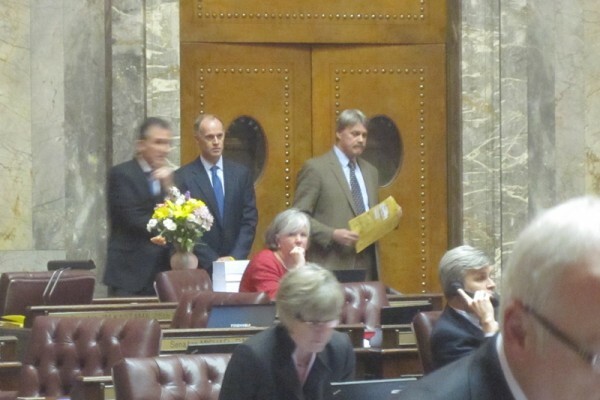 OLYMPIA, March 2.—A decision by Senate Democratic leaders to shut minority Republicans and moderate members of their own party out of the budget-writing process ended in an epic backfire Friday night, as three moderates bolted and threw control of the chamber to the GOP. Democrats fired back with delaying tactics that initially threatened to keep the Senate in session all night, but it appeared clear that Republicans had the upper hand and would be able to pass a GOP-written budget in the Legislature’s upper chamber. Democrats ultimately acknowledged defeat, and Senate continued to meet late Friday night to pass the bill. The move by Democratic Sens. Jim Kastama, Tim Sheldon and Rodney Tom to join with Republicans in a procedural motion was an historic vote on a scale with the Legislature’s decision last month to permit gay marriage in the state of Washington. The last time anything like it happened was 1987. Democrats cried foul; the Senate erupted in disarray, and crowds thronged the galleries and the wings to witness the sort of rout that might take place once in a legislative career. Angry stares from members on the floor were directed at the three who dared to break ranks. But Kastama, who is running for secretary of state this year, said he didn’t care whether he would face political repercussions. Despite their slim 27-22 majority in the Senate, Senate Democratic leaders chose this year to write a budget without Republican input, ignoring critics, unlike their bipartisan effort last year that brought both sides to the table. The result was a budget that left moderates and Republicans cold. It didn’t solve this year’s billion-dollar budget shortfall with the big cuts that would have brought spending into line with tax revenue. And it actually made the state’s long-term problems worse. Majority Democrats in the House and Senate are proposing that the state shift hundreds of millions of dollars in current expenses to the 2013-15 budget, when the state already expects to face a shortfall of between $1 billion and $2 billion. Something had to give – and what gave was party discipline. As debate progressed into the night Friday, the 22 Republicans and three Democrats were poised to pass a budget written by Senate Republican budget chief Joe Zarelli, R-Ridgefield. 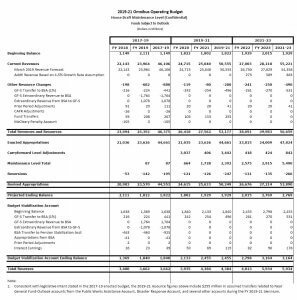 The budget makes $722 million in cuts, leaves a half-billion-dollar reserve, and it avoids entirely the shift in expenses to the next budget. It assumes changes in state-employee pension programs that will save the state $133 million in the short term and $2.3 billion over the long haul. Most education spending is spared. The budget preserves the Basic Health Plan, the state’s subsidized health insurance program for the working poor, but it eliminates the Disability Lifeline, the state’s medical assistance program for unemployable adults. The move came during a routine session on the Senate floor Friday afternoon and appeared to take the majority Democrats by surprise. State Sen. Don Benton, R-Vancouver, moved for the “9th Order of Business,” a procedural motion which allows a majority of members to vote to advance bills from a committee to the Senate floor. Republicans plucked an early version of the budget that had been submitted late last year by Gov. Christine Gregoire, as well as three Republican measures necessary to implement the budget that had been stalled in committee. As the roll call was sounded and the three Democrats announced their votes, it was obvious the battle was over. But majority Democrats proposed delaying motions, including one that required Senate clerks to read the governor’s entire 233-page budget bill in full. “I want to know what’s in it,” demanded Senate Democratic Floor Leader Tracey Eide, D-Kent. That was despite the fact that the governor’s bill had been released during the month of December, was widely publicized at the time, and was certain to be discarded the moment the Republican budget amendment was proposed. The Senate clerks spent an hour reading the doomed bill in tag-team fashion, until Eide finally admitted defeat and thanked the clerks for their service. They had gotten to page 34. During heated arguments on the floor, Democratic leaders made the curious argument that the tactic destroyed any sense of bipartisanship in the Senate – though they had acknowledged last week that a majority of their members had such strong differences with the Republicans that bipartisanship was impossible. Republicans didn’t rise to the bait during the floor debate, though a number could be found snickering in the wings. The other team was making arguments that until 3:34 p.m. Friday could just as well have been directed against the Dems. The three Democrats who turned the Senate upside down were among a group of five middle-of-the-roaders who had been threatening, at the very least, to withhold votes on the Democratic budget. Only Sheldon had gone all the way in declaring his preference for the Republican version. Others had said they were considering bartering their votes for big reform measures. Some of those bills are assumed in Zarelli’s budget measure, including Kastama’s proposal for a constitutional amendment requiring a balanced budget. Sens. Steve Hobbs, D-Lake Stevens, and Brian Hatfield, D-Raymond, remained loyal to their caucus and voted against the procedural motions. “Since before this legislative session began, the message from my constituents has been loud and clear. Another budget that is unsustainable, relies upon accounting gimmicks and sets our state up for a perennial deficit is simply unacceptable. Kastama said that by breaking ranks, the three Democrats have made it possible to end the session on schedule – as long as a compromise can be reached with the House. The budget written by the majority Democrats in the Senate was a non-starter and could never have gotten the 25 votes needed for passage, he said. It has been 25 years since the Legislature has seen anything like the scene that played out on the Senate floor Friday night. In 1987, three centrist Democrats balked at a budget that included a tax increase. Among them was Lt. Gov. Brad Owen, who then represented Sheldon’s district in the Senate. By voting with Republicans on a similar procedural motion, the rebel Democrats of 1987 gave the minority party the chance to write the budget. The duties fell to Republican Dan McDonald, who retired 10 years ago after a stint as Senate majority leader. Contacted by Washington State Wire Friday night, McDonald said dramatic votes like that one are a natural consequence when a majority party pushes its members too far. “I think that representative government really does work, and I think that when the majority party, whether it be Republican or Democrat, gets too far out of what the mainstream is thinking, you get folks who say, hmm, I don’t think so.